Stem cell therapy is exploding in the medical field, and for good reason. Stem cells have the potential to regenerate into any type of body tissue. The amazing thing about stem cells is that when you inject them into the body, they know what kind of cells your body needs – for example, meniscus cells or cartilage cells. It is a very exciting time for medicine, especially in the field of regenerative medicine. In our office, we often refer to this as Cellular Prolotherapy. Recent development in stem cell tissue engineering has created a lot of excitement in the field of cartilage regeneration biology. Stem cells are progenitor cells which differentiate into various cell types including osteoblasts (secretes the cellular matrix necessary for bone formation), osteocytes (the bone cell formed when the osteoblasts embeds itself in its matrix) and cartilage. Because of this, stem cells are being investigated for their abilities to regenerate cartilage in osteoarthritis patients. These cells also have demonstrated the capability to inhibit T cell growth, thus showing that they have the ability to down-regulate the natural inflammatory response in osteoarthritis. (This would be the runaway inflammation. Please see my article Stem cells bone regeneration | Repairing bone damage from osteoarthritis). In Stem Cell Therapy, we use a person’s own healing cells from bone marrow or fat. They are injected straight to the area which has a cellular deficiency, along with injections to all of the supportive joint structures for a more thorough stem cell therapy treatment. The goal is the same: to stimulate the repair of injured tissues. Stem cells aid in fibroblastic proliferation where cell growth, proteosynthesis, reparation, the remodeling of tissues, and chondrocyte proliferation occurs. Our bone marrow contains stem cells, also termed mesenchymal stem cells and progenitor cells, among other names. These immature cells have the ability to become tissues like cartilage, bone, and ligaments. In our research published in The Open Stem Cell Journal, Rationale for Using Direct Bone Marrow Aspirate as a Proliferant for Regenerative Injection Therapy (Prolotherapy). We not only showed the benefit of bone marrow derived stem cells as a Prolotherapy proliferant solution, but also that this exciting field of medicine needs doctors and scientists working together to expand research and technique guidelines. We chose to review this study to support our research and to inform people about the human studies using bone marrow stem cells for articular cartilage lesions. Articular cartilage is a type of cartilage that covers joint surfaces and is most susceptible to injury compared to other types of cartilage. Researchers at Cairo University School of Medicine and the University of Pittsburgh School of Medicine reported on the use of bone marrow mesenchymal stem cells and a platelet-rich fibrin scaffold to heal full-thickness cartilage defects in five patients. The researchers studied the treatment results from the bone marrow mesenchymal stem cells which were used in a platelet rich fibrin glue, placed on the tear and covered with a flap of the patients cartilage. 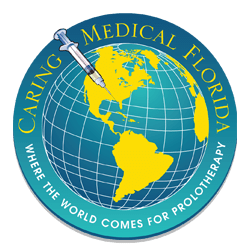 Why use Bone Marrow Stem Cells in Prolotherapy? The researchers from this study chose mesenchymal stem cells from bone marrow because these have the ability to differentiate into cartilage cells. In the case of these five patients the bone marrow was harvested from the iliac crest (hip bone). Platelets were used as a scaffold because platelets contain various growth factors that stimulate cartilage regeneration. The researchers expected that the biological effect of multiple growth factors on tissue regeneration is greater that of a single growth factor. The patients showed significant functional improvement. Two of the patients underwent arthroscopy after the transplantation and showed near normal articular cartilage. Three postoperative MRIs revealed complete healing and congruent cartilage tissue, whereas two patient MRIs showed incomplete congruity in the cartilage tissue. The researchers concluded that the transplantation of autologous culture-expanded bone marrow-mesenchymal stem cells in platelet rich-fibrin glue shows great promise in the treatment of full-thickness articular cartilage defects, particularly large-sized defects (>4 cm). The positive 1 year clinical outcomes support further randomized controlled clinical trials of this treatment modality with larger numbers of patients and longer follow-up periods. Bone Marrow Prolotherapy involves direct bone marrow aspiration (or also concentrated) to get the stem cells to the site of the injury. Does the study above suggest that direct bone marrow injections without culture expanded and without the scaffold would work? Possibly, but only time will tell as research progresses. 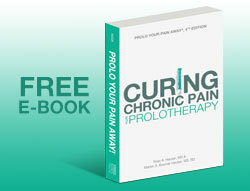 But in our experience we have discovered that these stem cells act as great proliferant solutions for Prolotherapy. We use bone marrow stem cells in conjunction with other Prolotherapy solutions to treat large articular defects in the labrum and meniscus areas. Typically, patients are seen every two months. Most patients need 3-6 visits. The good news is during the time of healing, the patient can exercise and start getting back into great shape! Bone marrow and adipose-derived stem cell therapies are gaining in recognition and we are happy to offer them as an option for treating chronic injuries and sports injuries. 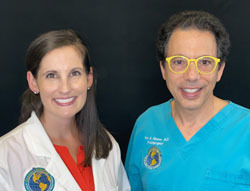 “Osteoarthritis is a cartilage degenerative process…No treatment is still available to improve or reverse the process. Stem cell therapy opened new horizons for treatment of many incurable diseases…In this research four patients with knee osteoarthritis were selected for the study. They were aged 55, 57, 65 and 54 years, and had moderate to severe knee Osteoarthritis. After their signed written consent, 30 mL of bone marrow were taken and cultured for MSC growth. After having enough MSCs in culture (4-5 weeks) and taking in consideration all safety measures, cells were injected in one knee of each patient. The walking time for the pain to appear improved for three patients and remained unchanged for one. On physical examination, the improvement was mainly for crepitus. It was minor for the improvement of the range of motion. We agree that stem cell therapy has benefits but may not provide a full cure. This is why we recommend the use of Platelet Rich Plasma Therapy in conjunction with stem cell therapy. The study above involved cultured stem cells. In our opinion Stem cell therapy is more effective if the stem cells are given better direction. This is where the growth factors in blood platelets can be very effective. Platelets aid the stem cells in their various jobs including differentiation and then aid in the differentiated cells making the extracellular matrix to repair the injured tissue. Numerous studies have shown that PRP enhances the effects of Stem Cell Therapy5,6 As the study above notes – “Results were encouraging, but not excellent. Improvement of the technique may improve the results.” Platelet Rich Plasma therapy improves the technique and improves the results. 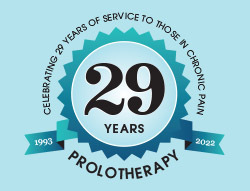 A page with more information on stem cell injection treatments combined with Prolotherapy and PRP Treatments for back pain. In this article we discusses research that shows thatstem cell injection therapy will aid in the repair of articular cartilage and meniscus tears. The treatment relieves symptoms of stiffness, pain, disability, and inability to walk as commonly reported by our patients diagnosed with knee osteoarthritis. 5. Mishra A, Tummala P, King A, Lee B, Kraus M, Tse V, Jacobs CR. Buffered platelet-rich plasma enhances mesenchymal stem cell proliferation and chondrogenic differentiation. 2009 Sep;15(3):431-5.